Two weeks ago I had the pleasure of speaking at the second DevOpsDays event in Cuba alongside some great technologists from across the US, Europe and Latin America. The conference was held in a beautiful hotel in Varadero overlooking a marina right by the beach. Varadero is approximately two hours by car from Havana. 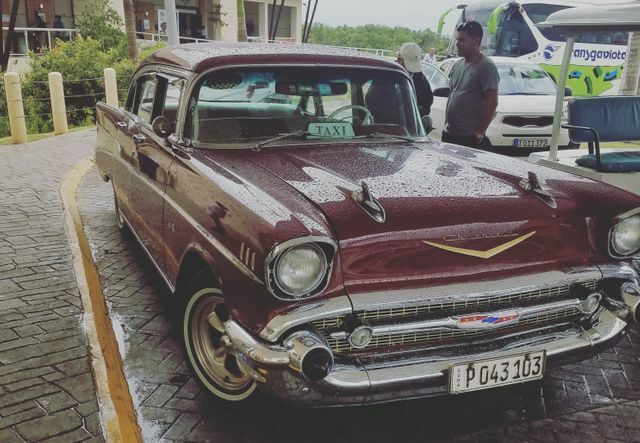 The first thing I noticed is that Cuba has so many anachronisms, this was evident as I walked out of Havana Airport and realized that the whole "they have some old cars" thing was so real. It was fascinating to see that every single car was Pre-1950's, some being perfectly maintained with great paint jobs and others in worse condition. However, still capable of doing their core job as a mode of transport. Talking technology in Cuba was an eye-opening experience, to say the least. Do not expect to have 3G or 4G. Do not expect to have WiFi in most hotels (you can purchase prepaid internet credit but the speed will be slower than what you are used to) and definitely do not expect to have WiFi in a private home. These are luxuries. Now the surprising part. There are companies in Cuba with fully automated CI/CD pipelines achieving 10-12 deployments per day and solving real problems such as the team working under Anesto del Toro at Datys. Cuba even has their very own Docker Captain, who gave a superb demonstration on the Value of Docker in front of the DevOpsDays audience. Now let me remind you, these guys are not working with stable internet connections and they manage to get the job done on a daily basis. So why am I rambling on about Cuba? Engineering is about solving problems. No matter how big or small, it's about looking at a problem and finding the solution. Now, this is part of Cuban life. If something is broken, they don't throw it in the trash and buy a new one, they fix it. Their 80-year-old car breaks down 2 hours outside of town? They get out of the car to fix it and take my word for this - their friends, family and neighbours will come outside to fix the problem too. This creates a mindset. The mindset of solving the problem at hand without fail. This is easily demonstrated when you talk to Cubans about Software Development - they won't say they are a Python Engineer, a Java Engineer or any other choice of language, they are Software Engineers who understand how development works as a whole. They will use the language required to get the job done to the highest standard. Like everywhere else in the world, there were huge differences in levels of DevOps adoption between the various organizations in the country. In contrast to the companies mentioned earlier, you also have organizations who have only just heard of these methodologies or they are now considering setting up their first CI pipelines. Like many of us, they are still figuring out how to solve their tech debt and modernize their IT Infrastructure but the key point is that the stakeholders, the C-Level Executives, the Junior Engineers and everyone else in between want to learn. They are open-minded to the principles of DevOps. Every person in the room at DevOpsDays Cuba was focused and listening to what we had to say. This excited me as a speaker and everyone else in attendance. We could see people who really did want to change and transform the cultures into their technology teams and overall businesses to start adopting these modern and proven practices. The journey ahead is a long one. The infrastructure challenges remain in place and there is a lot to be learned but it was great to see such positive energy and eagerness to adapt. I want to thank everyone who attended DevOpsDays Cuba for making it such an amazing experience. An even bigger thanks to the organizers such as Enrique Carbonell, Rudy Gevaert, Yadier Perdemo, Manuel Oliver, Mike Rosado, Manuel Morejon and anyone else I've missed. The event couldn't have been better and it was a genuine pleasure to visit Cuba, I hope to return soon and reconnect with as many of you as possible!